There are two "testimonial" homes in Riverside--one from Sears and one from Gordon-Van Tine. Both were featured in the 1921 catalogs of each respective company. Testimonial and photo in the 1921 Sears Modern Homes catalog. 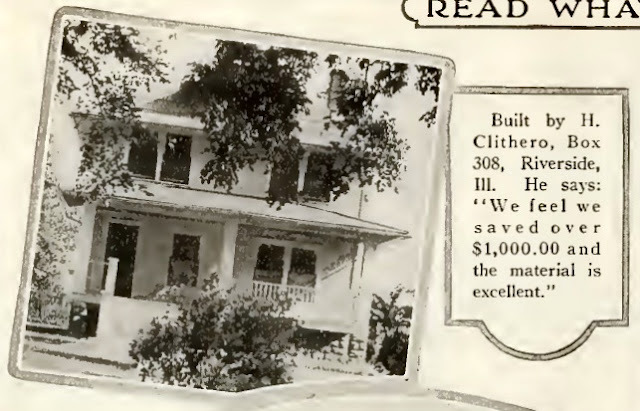 "Built by H. Clithero, Box 308, Riverside, Ill. He says: 'We feel we saved over $1000.00 and the material is excellent.' " That giant tree blocking the house is long gone today. 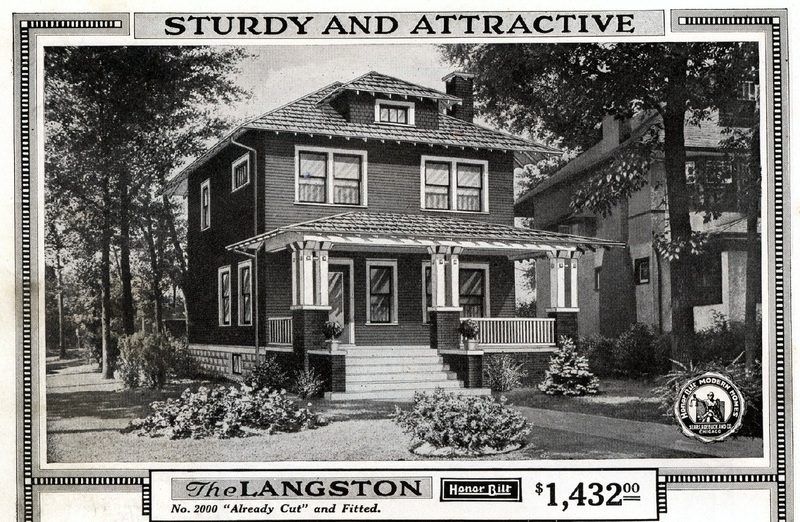 This photo shows that the decorative porch pillars shown in the catalog illustration were not put on this Langston. The living room of the Langston, as illustrated in the catalog. Scan courtesy of Sears House Seeker. Minna owned the house until 1953, after her husband's death in 1945. 256 Addison Road, Riverside. Shot from my car on a windy day! Photo from the 1921 Gordon-Van Tine catalog. "Home No. 529 built by J.T. Kittleman, 256 Addison Rd., Riverside, Ill."
Testimonial letter in the 1921 Gordon-Van Tine catalog. "I wish to express my appreciation of your prompt attention, and quality of material which you furnished me for my residence in Riverside, Illinois, a few months ago. All material was entirely satisfactory." The Gordon-Van Tine No. 529 is a Colonial home, a popular housing style in the late teens and early 20's. The company stated that,"The blinds, flower boxes and trellised entrance are touches that give the house an appearance of hospitality and comfort." James Russell Kittleman and his wife Grace built this No. 529 in 1920. He was a salesman for a furniture store. The family moved to California sometime after 1930 and no word if they built a Gordon-Van Tine house there.